As a manufacturer of safety couplings and torque limiters, we are often asked to provide some assistance in calculating the moment of inertia of various loads, in order to aid in selecting the appropriate disengagement torque settings. Once the driving and driven inertia values are known, acceleratin and deceleration rates are used to estimate safety coupling torque adjustment ranges. Moment of inertia can be described as a mechanical property of the mass of a solid object that quantifies the required torque needed to change the angular velocity of the object about an axis. This inertia is also known as the mass moment of inertia, first moment, or, rotational inertia. This moment can be used to calculate how much energy it takes to get an object rotating which is especially useful in mechanical drive lines with motors and engines. When sizing a torque limiter or safety coupling, it is important that the disengagement torque value be set to a value higher than what is required to accelerate the load up to speed. 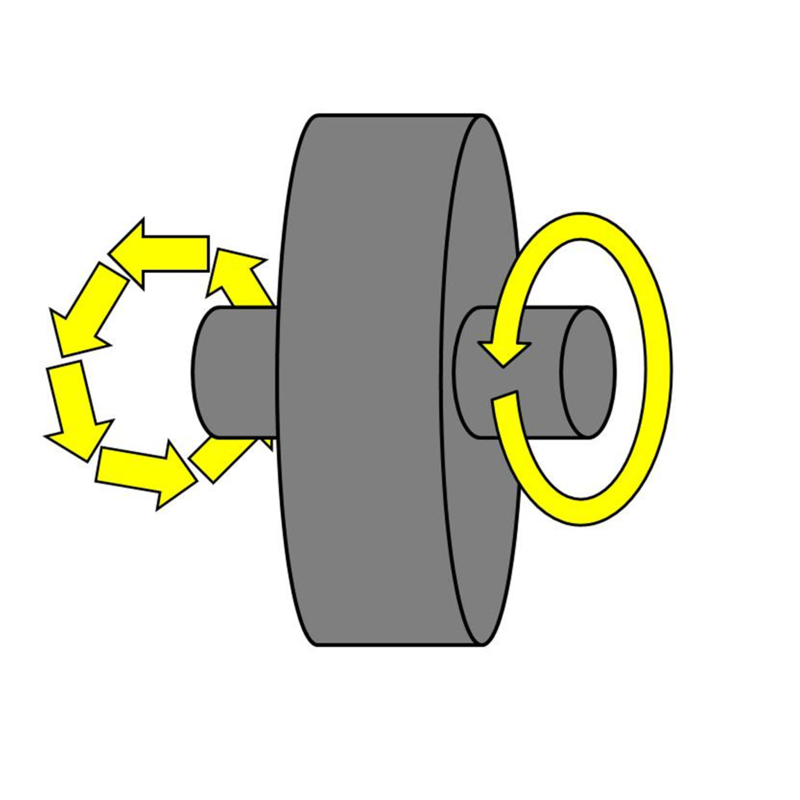 It is also helpful to be aware of the torque levels resulting from abruptly decelerating a rotating mass, which is where torque limiters and safety couplings come into play, protecting driveline components from the excessive torques resulting from an unintended blockage stopping a machine too rapidly. Moment of inertia often denoted as (I) is a unit of mass multiplied by area squared (M*A2). 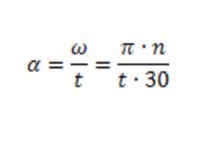 In the case of a two inch diameter rotating shaft with a mass of one hundred pounds, moment of inertia can be calculated per the example below. 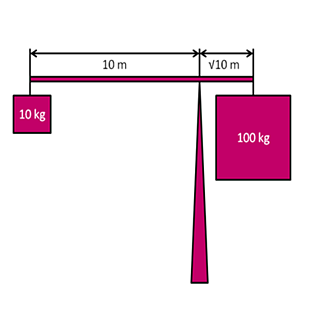 Calculating the moment of inertia for a 0.1 meter diameter shaft with a mass of 1000 kg is done in the exact same manner. Finding the moment of inertia for a tube or hollow shaft is very similar. 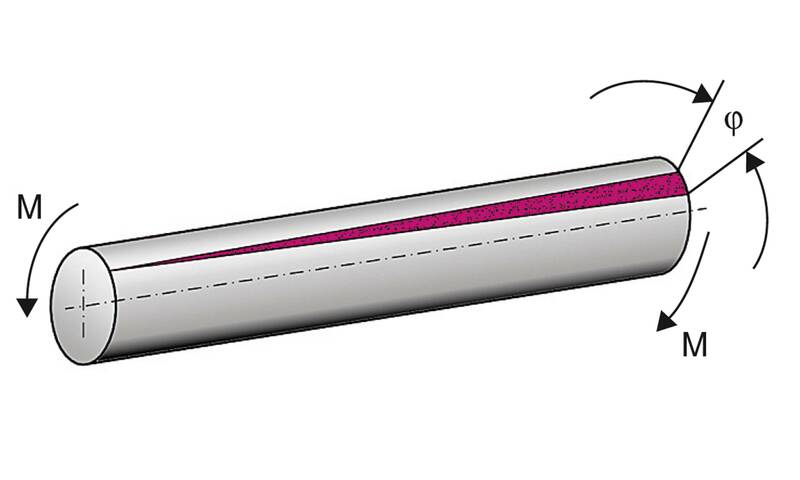 In the next example, we will find the value for a 0.5 meter outside diameter tube with a 0.3 meter inside diameter. The mass of the tube is 500 kg. The calculation for a moment of a square or rectangular shaft or shape can also be useful. In this example, the moment of a one inch by one inch square shaft with a mass of 1000 pounds will be found. The examples above are handy for calculations involving sizing of mechanical drive components, and not just safety couplings. 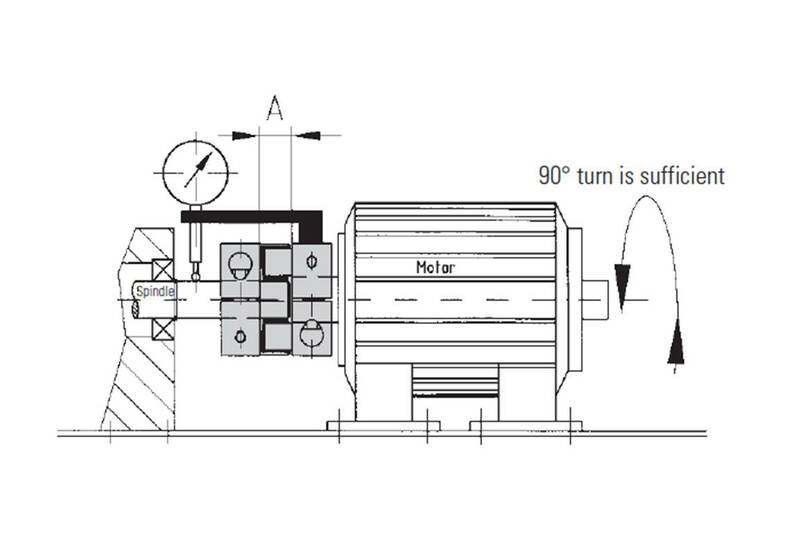 Inertia ratios of rotating shafts and motor rotors are critical to proper operation of many drives. These calculations are all done about the axis of typical shaft rotation and cannot be used for a different axis. It is important to note that this is the mass moment and the calculation gives us a property of mass at a distance from the axis of rotation. As with all rotating objects, the moment increases exponentially as a mass moves away from the axis of rotation. These basic facts of physics are critical for machine design and have been a primary guiding principle for centuries of mechanical engineering. Many machine builders are well aware of the advantages of using configurable components in the design stages. As projects progress, specifications often change and builders must adapt components to fit new constraints. Drive and electrical components must be flexible to adapt to new operating parameters or machine chassis dimensions. Electrical designers often make use of DIN rail mounted devices which can be interchanged quickly on the production floor or in the field. Circuit breakers, fuses, and power supplies can be easily changed out in the event that a different motor or sensor is installed. From the mechanical perspective it is usually coupling elements which need to be changed to adapt to new dimensions. This is why QD or similar bushings are typically used with V-Belt sheaves. If drive speeds change, a fairly quick sheave swap is all that is required. If a new gearbox or actuator needs to be installed, drive couplings in various lengths and bore diameters are often required in order to help get everything tied together. 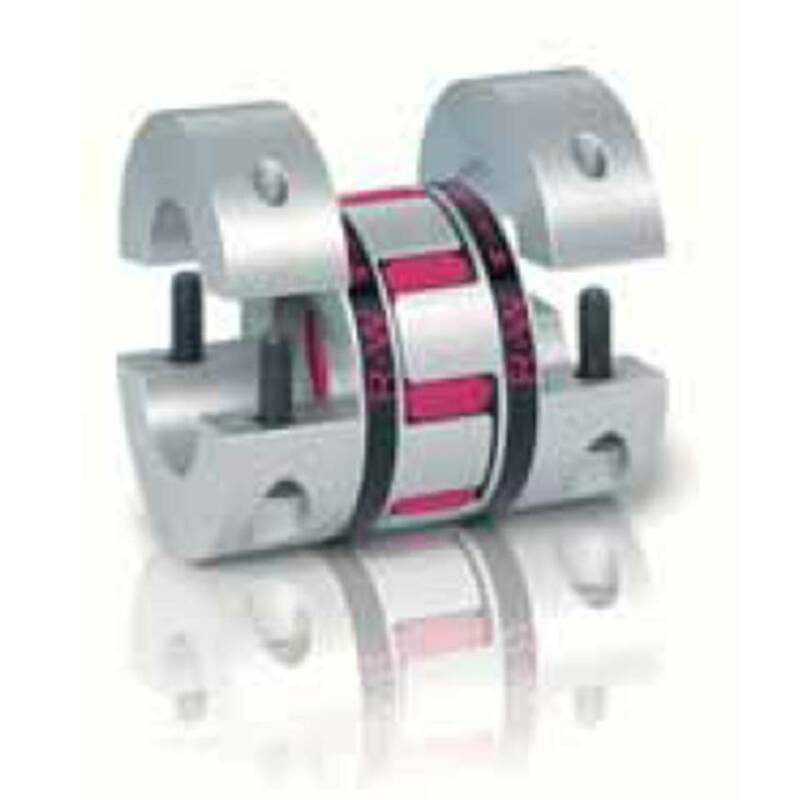 Finding direct drive couplings with compact dimensions and creative mounting configurations is normally fairly easy. But in some cases layout changes involve longer distances between mechanically connected equipment, requiring something a little more specialized. With longer distances between rotating components, designers are often in a position to choose between belt or chain driving, and using a direct drive line shaft system. 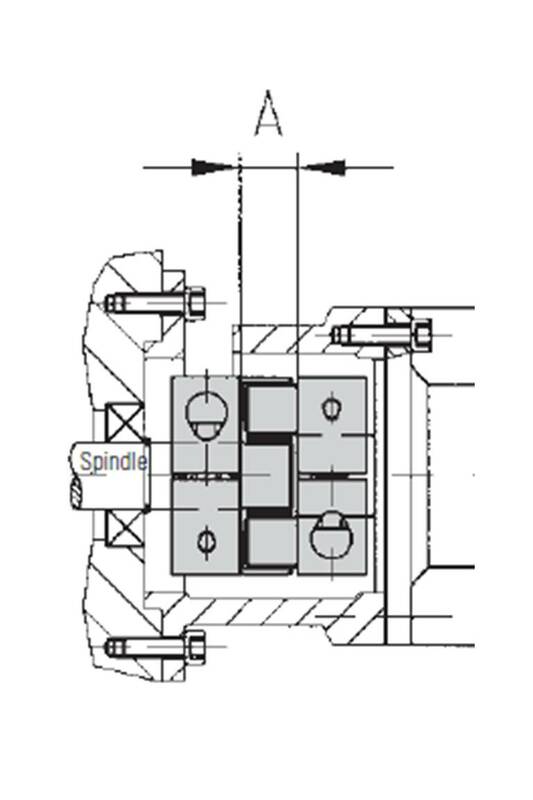 A direct drive line shaft coupling typically provides for stiffer power transmission than belts, which can be especially advantageous in applications that require precision timing and positioning or frequent changes in rotational direction. Line shaft couplings are also low maintenance compared with belts which need to be changed at regular intervals, just like car tires for optimal performance. But in the past there were occasionally major drawbacks to using direct drive line shafts over belts in some applications. Assembly with steel shafting and standard couplings generally requires intermediate support bearings and is not very well suited to higher drive speeds over long distances. Most preassembled torque tube styles of line shaft couplings are also built to order rather than being stocked by many large industrial supply companies. In the past a typical prefabricated torque tube style line shaft would need to be rebuilt if length or shaft sizes changed. In more recent years, prefabricated, variable length, telescoping line shaft couplings have been brought to the industrial market in order to address the growing trend toward designing with direct drives. 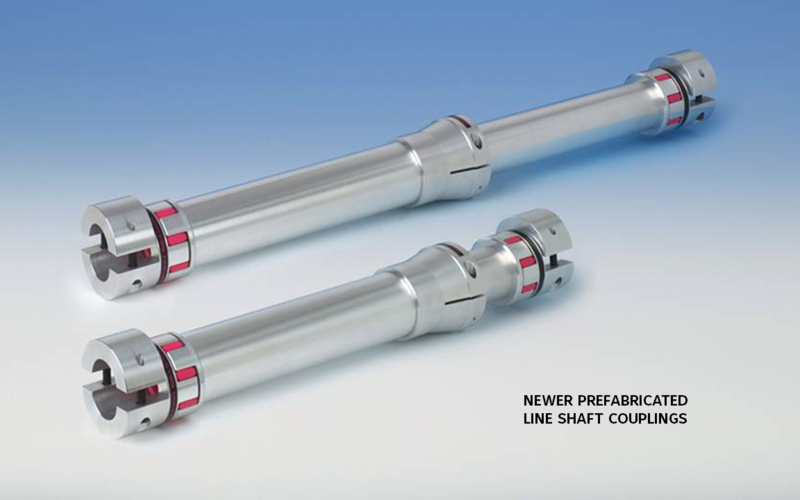 A variable length line shaft with removable hubs solves the issue of shaft sizes and lengths changing (within adjustment range) as a machine is built or upgraded. With a variable length line shaft, the overall length can be changed in minutes by simply loosening and tightening a couple of machine screws. Jaw style hubs or flange mounted bellows coupling hubs can be swapped out with stock parts in less time than it takes to change a v-belt sheave and re-tension belts. Additionally, common size adjustable line shaft couplings are stocked by many distributors and ready to ship with hubs just like sheaves and belts. This new take on configurable coupling component technology ultimately saves cost in labor and/or materials over time. While newer components produced in smaller quantity can have higher pricing up front, they can actually lower the cost of maintenance and overhaul down the road. Making use of a more precision product can also help to increase the rate at which a product is manufactured. As we all know, increased productivity and lower service costs ultimately decrease the time over which a return on initial investment is seen. This makes money for our employers, which is something I’ve found they enjoy universally. Today’s mechanical drive components market is flooded with a wide variety of direct drive couplings. Many folks working with or designing drives are not familiar with the different technologies or differences in quality and precision between manufacturers. One prime example is with elastomeric jaw couplings. 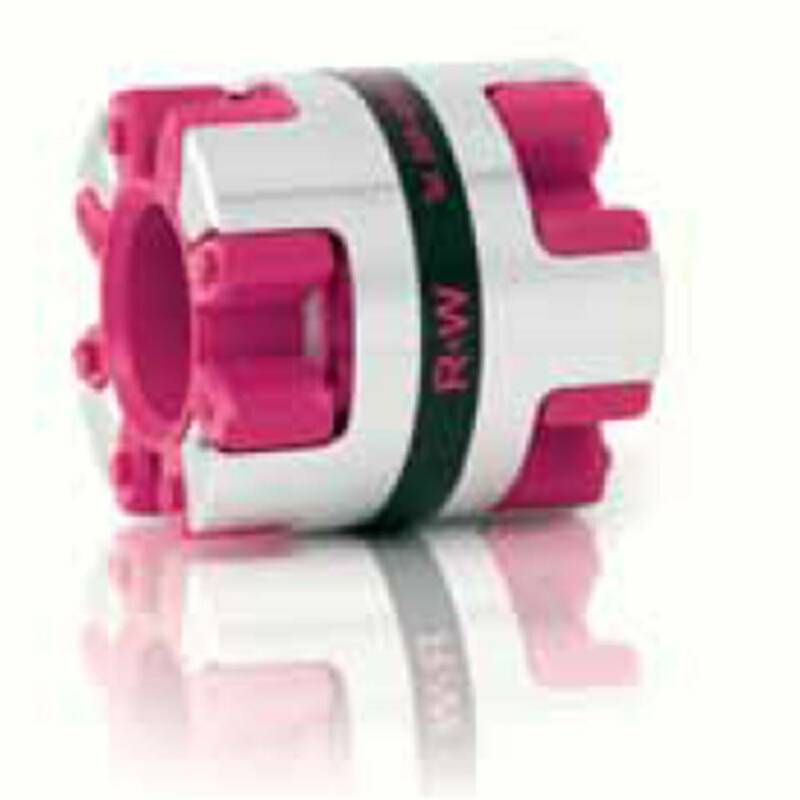 Elastomer jaw couplings have been around for 100 years or more. Most of these couplings use two hubs and an elastomeric spider between the jaws to transmit torque. Although they look essentially the same, the applications can vary greatly. 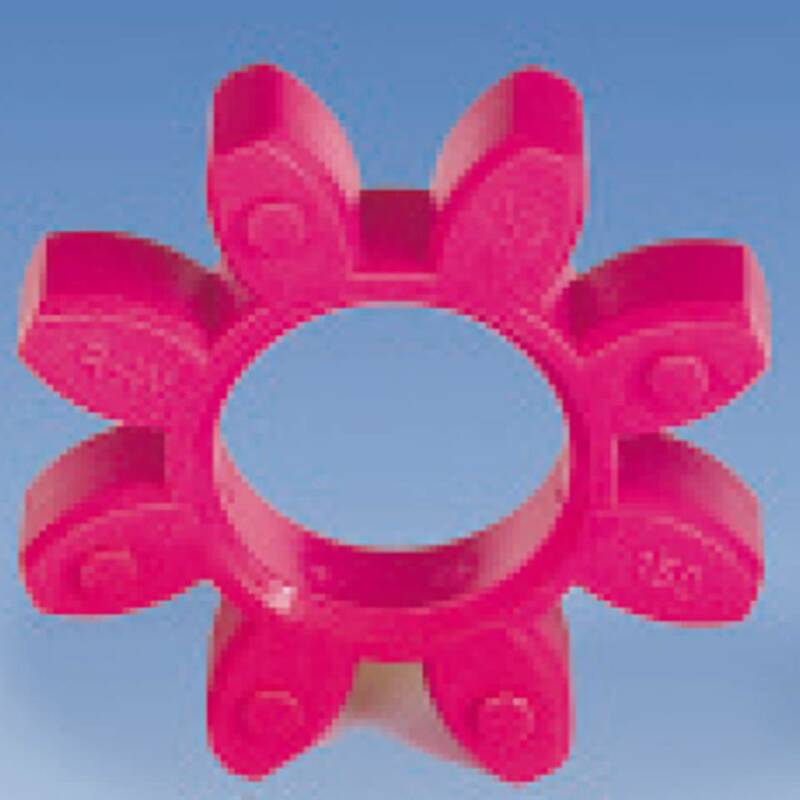 Much of the market by volume of units sold consists of low manufacturing cost cast hub couplings with a rubber spider element. These hubs are used in drives such as conveyors and centrifugal pumps turning in one direction where precise shaft position is not important. 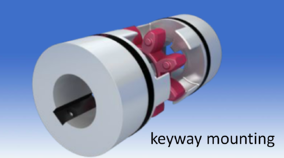 Torque is usually transmitted accross the hubs by means of a keyway locked down with a set screw. Many of the machine frames are formed and welded to loose tolerances. 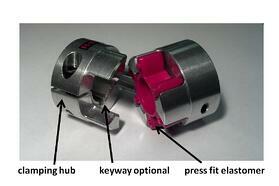 The coupling design has plenty of play between the spider insert and jaws to accomodate shaft misalignment. This design is optimal for producing machinery where labor time to align shafts is cost prohibitive, and they are ideal for less demanding applications. 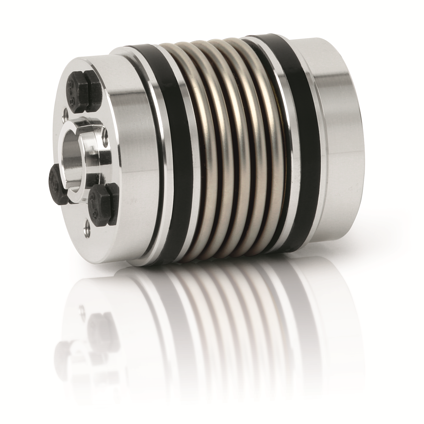 A somewhat smaller part of the market volume is precision backlash free or low backlash elastomeric couplings. 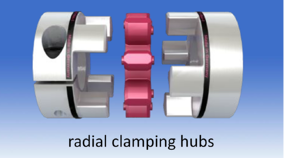 The hubs of these couplings are generally machined from solid stock with clamping features incorporated into them for wear free and play free frictional connections to the shafting. This can eliminate the need for keys and keyways and also enhance performance while improving longevity. The machined hubs typically also come with curved jaws held to a very tight level of concentricity in reference to the bore. Measuring concentricity from the jaw to the bore is what ensures smooth transfer of rotation from one jaw set to the next. Wear resistant polyurethane inserts are then put through a secondary “match molding” process to smooth out any inconsistencies on the driving lugs, before being press fit into the hubs for a preloaded zero backlash assembly. 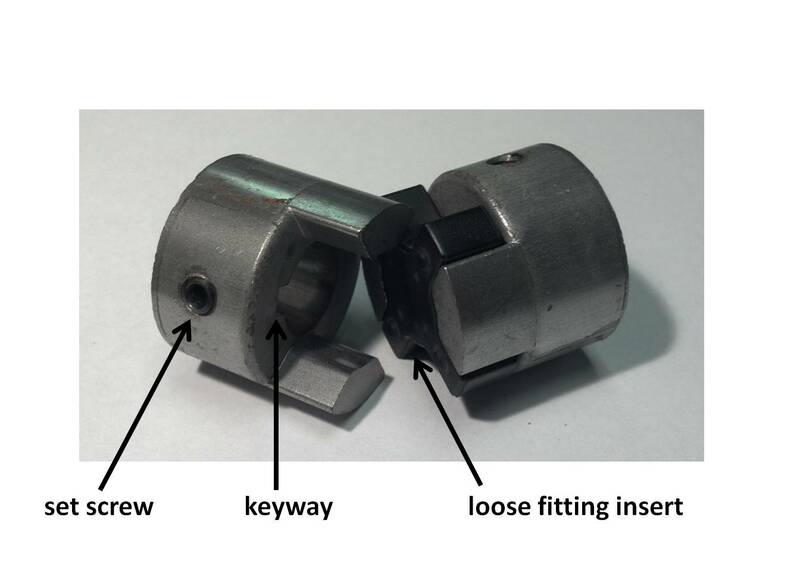 Being based on the same principle of mounting a resilient element between the jaws of two metallic hubs, they look similar, but are quite different in some key characteristics. Because the hubs are precision machined from solid bar stock, they are naturally more expensive than a cast or sintered hub. But considering that both coupling styles are relatively inexpensive, the cost differences are often far outweighed by the benefits in situations where high torques or shock loads must be transmitted through a small space envelope, as can happen in many pumping, conveying, crushing and grinding applications to name a few, or in cases where dynamic motion needs to be transmitted smoothly, like in servo and stepper motor driven machines. In the latter situations the precision concentricity and backlash free characteristics, and not only the stronger material condition of the hub benefit the user and the process. One of the assumptions being made with this design concept is that that a higher value will also be placed on the overall quality of the drive line assembly, which always includes precision alignment. It is not uncommon for someone to switch to a precision elastomer jaw coupling and hear an audible clicking as the equipment runs. Because the elastomeric spider element is preloaded in the hubs and is a slightly harder material, it will rub on the metal surfaces audibly if there is significant shaft misalignment. Although lubricant can be used to address the clicking, eventually the elastomer segment may need replacement. But when alignment is addressed they can be wear-free for a theoretically infinite service life. Many motors, gearboxes, linear actuators and pumps have precision centering features already incorporated into their mounting frames by the manufacturer for this very reason. When the coupling is installed inside a housing or bracket which takes advantage of a centering feature on both pieces of coupled equipment, then alignment is normally within the allowable limits for the precision variety of elastomer coupling. When no such feature exists, then alignment must be checked manually. There are several approaches which can be taken to address this potential issue. 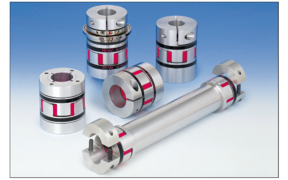 For a single elastomer element coupling the shafts need to be precisely aligned with dial indicators or laser alignment systems in case the shaft alignment is not inherent to the mechanical assembly. 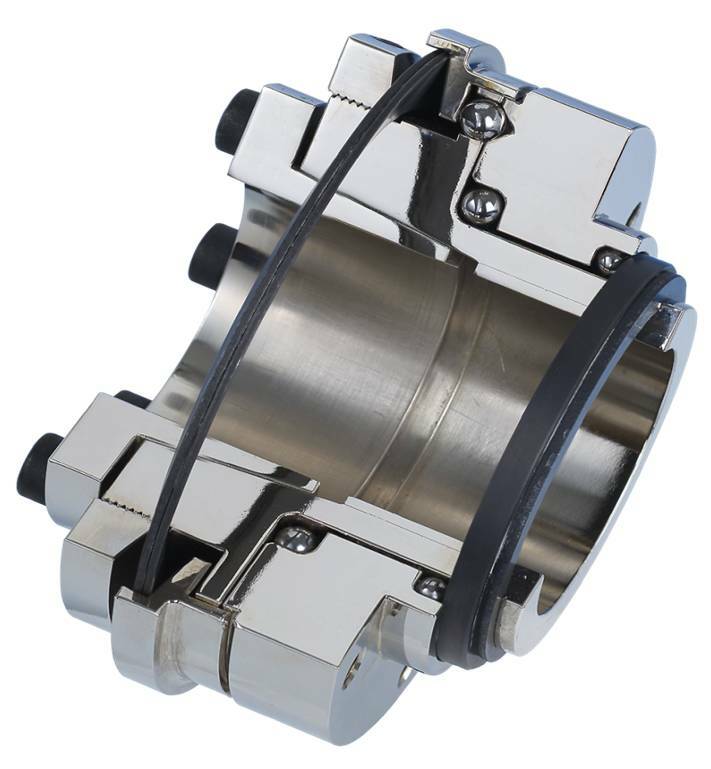 For situations where space is tight, split hub couplings are available to be installed laterally after the manual alignment check has been performed and any necessary adjustments have been made. 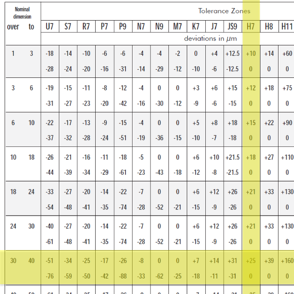 Then, in cases where precision manual alignment is just not practical, there are other options. 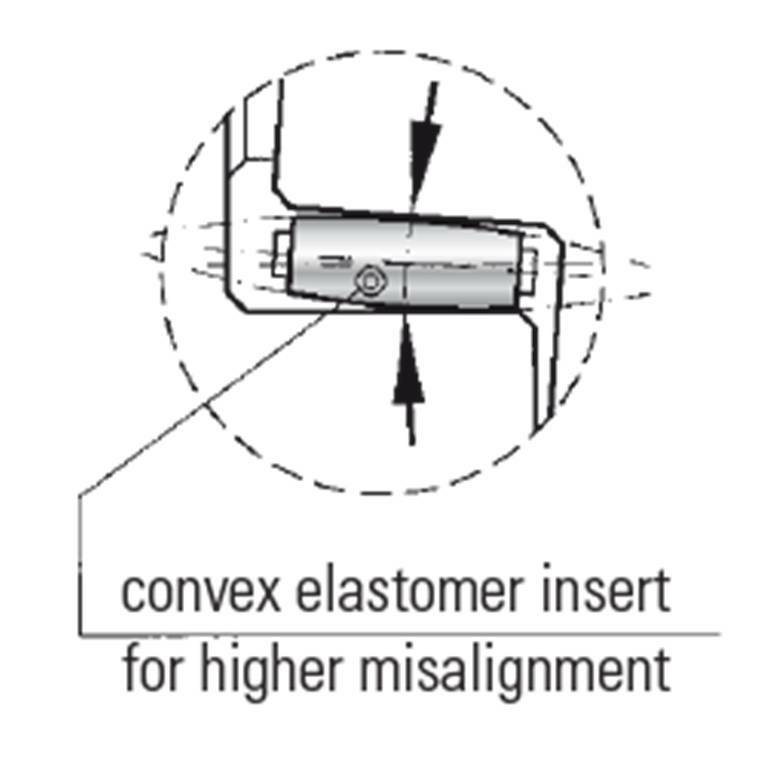 Many manufacturers make the urethane elastomer segment available with a convex tooth geometry, which allows for a rolling action as the coupling hubs rotate under angular misalignment. When two are used in series with a coupling spacer, the ability to compensate for parallel shaft misalignment is magnified to many times greater than with the single element version, allowing for simple visual shaft alignment, while at the same time maintaining the benefits of relatively low inertia, zero backlash and high torque density. While these two different shaft coupling styles may look more or less the same, small differences in materials and manufacturing processes can mean big differences in terms of the end result. 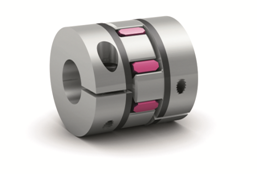 When considering making the switch from traditional to precision varieties of elastomer insert jaw couplings, consider discussing your requirements with the manufacturer, and make sure to check all of the specifications to get the best coupling for your unique situation. A customer sizing an elastomer insert coupling recently asked us if using a larger body size would provide better vibration damping. In a word, the answer was, yes. Vibrations in machine shafts come from a wide variety of sources. Machines that crush and shred materials can impart quite a bit of vibration into the drive line and prime mover. These types of machines can cause motors and mechanical driveline components to fail prematurely if proper damping measures are not in place. Conversely, driving components, especially internal combustion engines, can impart severe vibration down the driveline. While R+W specializes in vibration damping couplings for electric motor drives, the concept of increasing driving inertia for smooth continuous rotation is most easily explained and widely understood in terms of internal combustion engines. One of the oldest methods mechanical designers have used to damp vibrations is employing a flywheel. This device is still widely in use, in many parts of industry. Using laws of basic classical mechanics, “a body in motion tends to stay in motion, while a body at rest tends to stay at rest,” designers know that it is difficult to change the rotating velocity of a massive, high inertia flywheel easily. This is why a flywheel is used on the output shaft of many combustion engines, since they tend to continue rotating smoothly rather than jerking severely every time a cylinder fires. A large drive coupling or belt pulley would have the same effect. Piston air compressors often have massive cast iron sheaves driving them for this reason. In situations where inertia, space and power consumption are not of concern, it can be beneficial to use shaft couplings with larger and heavier hubs than are necessary to simply transmit the torque. At R+W we have machined flywheel features directly into steel coupling hubs on many occasions in order to assist customers with torsional vibration damping, especially in pump coupling applications. 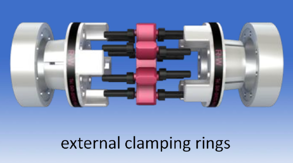 Another reason to consider upsizing for vibration damping is that in the case of elastomer insert couplings, the vibration is spread over a larger area which can also provide damping. In general, using the “bigger is better” concept is often a good policy when the priority is to make a robust and smooth running machine more so than a quick moving, light or compact machine. For many folks this concept is basic common sense, however in this day and age of making everything more compact, this principle can be overlooked when it might make a lot of sense. Customers often ask us for a bit of assistance in comparing torsional stiffness values between flexible couplings made by manufacturers using Imperial versus SI units. This may be considered rudimentary to some but a quick refresher never hurts. Any drive component which transmits torque will twist a bit when torque is applied. For example, if a shaft was marked on each end very precisely notched on the same plane along its axis, the notches would move apart as torque is applied. The amount they move apart is proportional to the applied torque. Therefore, torsional stiffness is called out in units of torque applied per angular unit of twist. North American manufacturers tend to use a variety of different units while Europeans typically use Newton meters per radian. I've provided an example conversion below. In this example calculation, we are converting a given stiffness value of 76000 N*m/Rad to in*lb/Deg , this will require a bit of unit conversion. As many of us may remember from college chemistry, we are allowed to multiply ratios of different units that mathematically equal 1 to cancel unwanted units and convert to the desired ones. 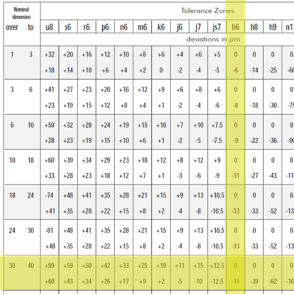 Below, we can see that the units in red cancel. In just a couple of steps the desired units emerge. As we see in the example, if we we’re comparing flexible couplings, the top one would be more torsionally stiff. Having a high level of torsional stiffness is not always desirable, especially if someone wanted to use the flexible coupling to damp vibration. 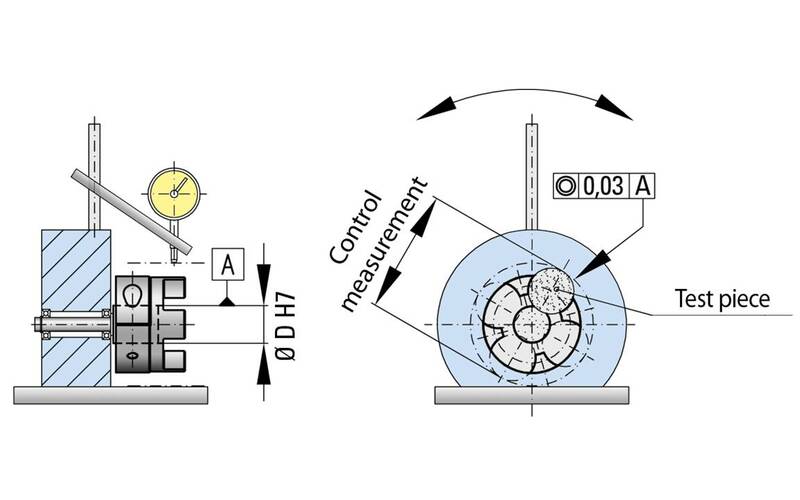 However in many cases machine builders need to maximize torsional stiffness in order to reduce settling times in highly dynamic applications or to maximize rotational positioning accuracy. In the case of flexible shaft couplings, elastomeric (elastic) couplings are typically used for vibration damping, and metallic couplings are used for maximizing torsional stiffness. This example can be used for comparing any multitude of different units as long as the correct conversion ratios are employed.